"When I was about 18 I had a serious urge to play the trumpet - I have no idea where it came from as up until then I had no idea what I was going to do in life. I joined a brass band in Barnet as they gave you an instrument, and I chose the cornet as it was as near as I had seen to a trumpet. I soon got kicked out as my reading was hopeless - but I could work out a tune in my head." "I progressed from there to buying a trumpet on the HP by forging my dad's signature. As jazz was the thing in those days (1960's) I was hooked, I led several small bands of my own and had reverted back to cornet and started playing sax. 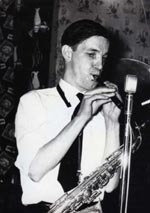 I joined Spencers Washboard Kings playing bass sax and second cornet on the Hot Five numbers, I got the job as I was the only youngster playing a bass sax at the time but I switched to baritone sax as it was easier to lug about. To cut a long story short I was in Manchester and saw this tiny cornet in a music shop window (Mayers & Harrison). It was to be my first Pocket Cornet made by Boosey & Co. so I knew it was a good make. It was £7 in its original leather case - a week's wages in those days - anyway I had to have it and I have been playing it ever since. The tone is superb, it is light weight and the valves are heaven. It makes me look taller when people think its a normal size cornet! I have played it all through my career with The Bonzo Dog Doo-Dah Band, The Temperance Seven (two tracks), The New Vaudeville Band and latterly with my own band Bob Kerr and his Whoopee Band (video) . The cornet is a terrific instrument to play and I have never bettered it." "I have around 10 Pocket Cornets of varying ages including a couple of new ones but none of them beat the tone of my Boosey. I suppose they look a bit like a toy but that is where the similarity ends, they are a perfect instrument - after all Don Cherry, Bobby Hackett, Maynard Ferguson, Roy Eldridge and many more trumpeters played them. They are sometimes called "Parlour Cornets". A new book has just come out by Nick DeCarlis called "Pocket Cornets: Actual Size" and is a marvellous history of the instrument. I have collected all sorts of odd instruments over the years 'for my pension' but now I am well over pension age I cannot bear to let them go. I have slide saxophones, echo cornets, 4 string Strovials a collection of one-string fiddles and much, much more." If anyone has one of these small cornets locked away on the attic please contact Bob at bobwhoopee@aol.com. In a recent discussion about unusual jazz instruments, we came across a reference to the pocket cornet (Don Cherry played one). As many will know, cornets are nearly identical to trumpets in that if you were to unwind the the total length of the tubing it would be the same, so they play in the same key. Historically, cornets are 'conical bore' instruments in that the diameter of the tubing gradually increases from start to end, while trumpets are 'cylindrical bore' - the diameter maintains the diameter until the bell. (There are arguments about this definition). Pocket cornets are cornets that have their tubing wrapped in an exceptionally compact design, resulting in an instrument 7 or 8 inches in length, but play in the same key and tonal range as full-sized cornets. Apparently, pocket cornets were primarily intended as useful for travel, as novelty instruments or for use by children. To see pictures of pocket cornets and for more information about them, visit Nick DeCarlis's interesting site at www.pocketcornets.com. We would be interested to hear from anyone who has played one or come across one in jazz. Roger Trobridge has given us a link to Pat Missin's website with more information about the Goofus (click here). Pat and Roger are looking for more information about the instrument and any pictures people may know of - let them, or us, know if you can help. There is more information on Wikipedia and another picture shown at this Squeezytunes link. Some readers may also know of the song Goofus by the Carpenters. Roger is not sure whether the instrument played on the Carpenters' video (click here) is truly a Goofus - the picture is not very clear - what do you think? The 'Goofus', a nickname for the 'Couesnophone' (pronounced Queenophone) was produced by 'Couesnon' instrument makers in France and patented in 1924. It is made of a brass tube one and a half inches in diameter with a tapering curved tube to blow through and a saxophone-like bell purely for looks (it is said that Adrian Rollini discarded the bell). It is a 'free-reed' instrument, is polyphonic and has harmonica-style brass reeds. Mine was discovered on Ebay some years ago. I was amazed that I succeeded with the bidding! It has 25 push buttons and a range of two octaves in 'C'. A modern version is the Hohner 'Melodica', also polyphonic, meaning one can play chords, and is much the same principle but the body is made of plastic. Brian was with the Original Downtown Syncopators, Spencer's Washboard Kings (Carl Spencer and Bob Kerr), Harry Strutter's Hot Rhythm Orchestra and is currently with Spencer's Nighthawks Orchestra, the Vintage Hot Five and Maurice Dennis (of Harry Strutter's Hot Rhythm Orchestra). For Brian's biography click here. "Enthusiasts of 1920s jazz have surely heard of Adrian Rollini, bass saxophonist with the California Ramblers. He was a child prodigy (a piano concert at the age of four!) and took up the bass saxophone around 1922. His recordings are exceptional, but it is his adoption of novelty instruments, heard on his recordings, that were a mystery to any listener. Try searching for 'Hot Fountain Pen' on the internet, also the 'Goofus' - of which there are some pictures but little information. Rollini came to the UK to work with the Fred Elizalde Orchestra and made some records for Brunswick around 1928. He brought his Hot Fountain Pen and his Goofus with him. 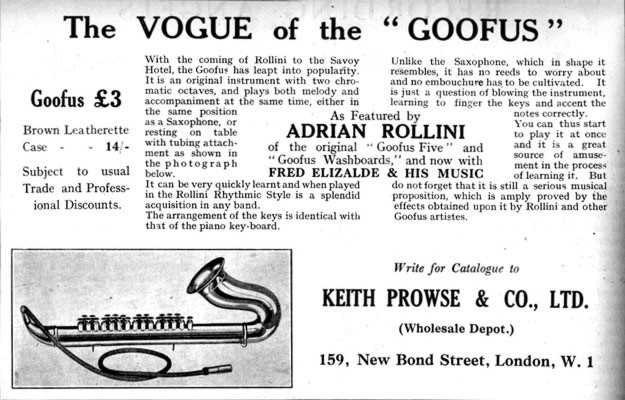 In the Melody Maker for 1928/30 we see adverts by the Keith Prowse instrument company - 'Rollini's secret out at last!' with a picture of a Hot Fountain Pen available in the key of 'Eb' for seventeen shillings and sixpence, and in 'C' for eighteen shillings and ninepence. The 'HFP' is a miniature clarinet made of ebonite. It is ten and a half inches long from its miniature mouthpiece tip to bell-less end and the body is three quarters of an inch in diameter. The mouthpiece has a single screw ligature and an Eb clarinet reed can be used. In the 1960s I used to haunt the second hand shops and music shops in my home town Eastbourne. Near what was then the Star Brewery was a tiny second hand music shop (now a coffee shop) run by a dear white-haired old lady whose name I found was Miss Addie Norris. This was also where I bought my first clarinet. Leaving the shop I noticed a jar by the door full of fifes and small flutes. I had a look through and noticed one had a single reed, ah-ha, a hot fountain pen! "How much?" I asked. "Oh, that's a pound", she replied. So that was my first. Years later it was in my tenor sax case and was left behind in Chiswick while packing the bus prior to leaving for a gig. The tenor sax was insured, but to lose the hot fountain pen was unfortunate, to say the least. Later still, I wondered what my chances were of finding another? A lady collector near Tunbridge Wells has one, and I copied down the exact dimensions. I know John R.T. Davies had one, and there is one in the Bate Musical Instrument Collection. I decided to fashion one from a bamboo tube, burning in the holes with a heated drill-bit, but no miniature mouthpiece was available. I visited Alan Swainston-Cooper's widow (Alan Cooper of the Temperence Seven), and she kindly let me have two miniature mouthpieces from what was left of his instrument collection, one of which fitted my bamboo creation fine. I also had one made in African blackwood by Fred Rose, a flute-maker, which was rather more in tune, as I had found the Keith Prowse model was sharp on its lowest note! Some time later Tom 'Spats' Langham and Martin Litton contacted me to say they had discovered two Hot Fountain Pens, one in Eb and one in C! and I purchased the one in Eb ....... ". Brian now has quite a collection of instruments including a Goofus, a swanee sax, an old 'quite curly' soprano sax, a Buescher bass saxophone, and numerous other instruments (some of which are for sale). To read more about the Goofus, click here. The Bate collection of musical instruments mentioned by Brian is in St. Aldate's, Oxford. It is a fascinating collection and well worth a visit: click here for more information. As for Hot Fountain Pens, I spoke with Spats Langham only the other day and he was given two of them by the late Alan Cooper (with whom I had the greatest pleasure of playing in my band 'The Sunday Band' for many years along with Colin Bowles from the Temperence Seven). One HTP has gone to Norman Field and the other to Brian Hills who played with Spencer's Washboard Kings at the same time I was with them. He was, and is, a fantastic player on the Hot Fountain Pen. We were playing quite a bit of Bix stuff in those days so we all knew Adrian Rollini played one, but had never seen one. I remember Brian making reeds for it cut down from clarinet reeds.